Three teenagers have been charged with the murder of a 20-year-old man who was stabbed to death in east London. Syed Jamanoor Islam died in hospital after an attack in Wager Street, Mile End, on 11 April. Three youths, aged 18, 17 and 15, have been charged with murder. They are due to appear at Bromley Magistrates' Court later. 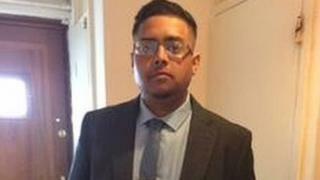 Mr Islam was one of three people stabbed to death in little more than 24 hours in attacks in London.